The system consists of two parts, a point capacitance level probe which is located in the priming tank and a dedicated electronic controller mounted external to the tank. The APP system provides a fully automatic smart pump priming system. Solid state outputs can be used to directly drive a solenoid and clutch, or used as digital inputs for other control and monitoring equipment. The controller features solenoid anti-splash and sensitivity controls, and the clutch has an automatic resetting timer. The probe operates on a capacitance detection system so works in dirty water as well as contaminated oily liquids. 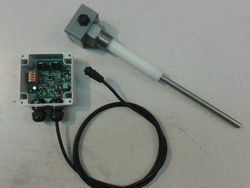 Designed to operate with a +12VDC negative earth system. User adjustable solenoid response time, 0.2 to 2s. Resetting clutch timer, factory fixed 15, 60 or 90 seconds, specify on order. User adjustable input capacitance sensitivty control.